When I look at Shelby, I see a whole lot of myself in her. Good or bad, she's very much a mini version of me. I especially see this when she exercises her independence. She's incredibly strong willed and independent. She has to do everything herself, from picking out her clothes and getting dressed to scrubbing her hair or preparing her food. 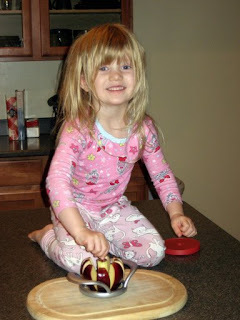 This morning, when I was making Shelby breakfast, she decided she wanted an apple. But I couldn't clean it or cut it for her. She climbed up on the counter. Washed her apple. 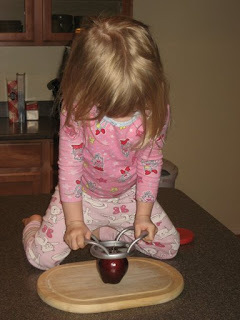 And then she had to use the apple slicer herself (I supervised). She was so proud of herself when she had her apple all sliced up and in a bowl. My girl is just SO big and SO independent.